This blog post is to assist new users to get started quickly with the creation of a new “avatar” in OpenSimulator (also known as “OpenSim”), an open source virtual world server similar to the commercial Second Life service and accessed with the same sort of virtual world “viewer” as is used for Second Life. It also gives a quick guide to your initial login on an OpenSim “grid” and your first visit a virtual world “region” on that grid. Finally it describes how to visit other connected grids that make up the virtual world “Metaverse” via the “Hypergrid”. 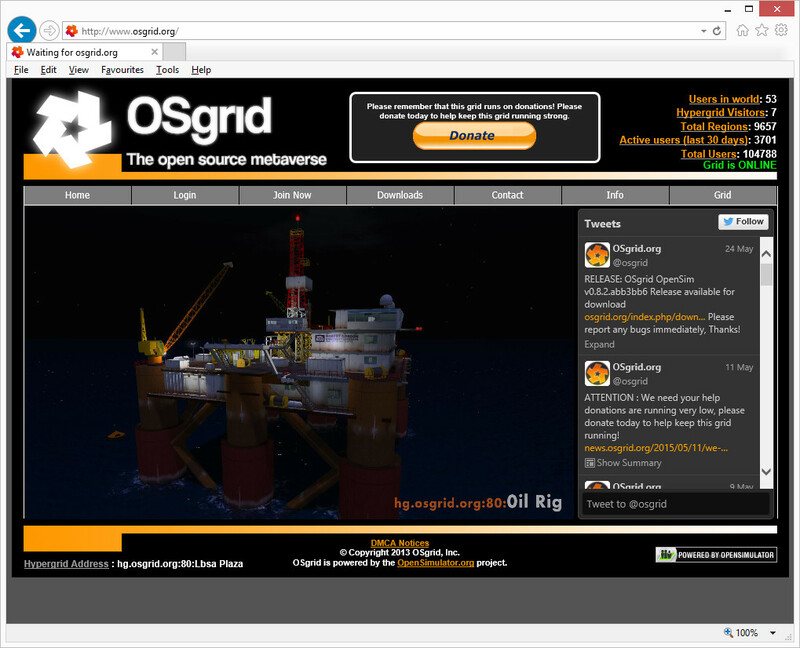 OSGrid is a grid provided by OpenSim community members and enthusiasts and often used for development testing and community meetings. It runs entirely on donations from users. It allows anyone to create a free avatar and even to attach “regions” hosted on their own servers or home computers. Create an avatar and select an avatar name at http://osgrid.org. Download and install a suitable virtual world viewer on a system that has a good graphics capability. The viewer should be OpenSim capable. The standard open source Linden Lab provided viewer incorporates a commercially licenced physics engine (Havok) which means it cannot be directly used for OpenSim access, but many third party viewers based on the same core open-source code are suitable. I recommend Firestorm… under the download tab select the variant that indicates its “For SL & Opensim”. Windows (32 bit and 64 bit), Mac and Linux versions are available. Run the viewer, select the grid to log into as “OSGrid” and log in with the avatar name and password you created earlier. When you are logged in you normally initially arrive at an introductory or welcome region where help boards can assist you in understanding how to use the avatar and camera movement keys and do other simple operations. You can also usually select some free avatar appearances there. Don’t worry if you initially appear as a “cloud”… it just means you don’t have an initial preselected appearance. Some grids set up such a default appearance (the “Ruth” default basic avatar is common), others don’t. “Wear” one outfit and if you want you can change your appearance in the viewer. There are many facilities in OpenSim, but find your feet and make sure you can do basic movememt, use the camera separate to movement of the avatar, sit down, text chat to others and even try to connect a headset for voice before you go further. Media playback on screens in OpenSim may require media plugins if suitable versions are not already on your computer. Others in world, or a search on the web can give more guidance, e.g. here. It is possible to add your own regions and your own content to OpenSim. OSGrid makes available a ready-to-run download of the code to add a region onto the OSGrid grid. See OSGrid’s Download and Grid information pages for advice. This entry was posted in OpenSim, Virtual World and tagged Avatar, Getting Started, OpenSim, OSGrid, Virtual World. Bookmark the permalink.